Team Online member Jaime Staples has scored a hat-trick win this week. Staples won the $55 Bounty for $2,958.93 on Saturday, the Hot $33 (with a set of kings) for $7,024.71 on Sunday, and finished things off with a $2,107.11 win in the $33 NLHE 6-Max Hyper-Turbo on Tuesday. The Canadian celebrated in his usual style by purchasing art live on his Twitch stream. The total guaranteed for PokerStars Championship Barcelona which takes place August 15-27. Hollywood star and PokerStars ambassador Kevin Hart has announced that he will be attending Spain’s biggest poker event of the year and is looking to swipe the crown from reigning Super High Roller champion Fedor Holz. Satellites for both the Main Event and the National Championship are currently running on PokerStars, where players can qualify for as little as €1. Online Day 1B and Day 1C of the PokerStars Sunday Million Live take place this Sunday, June 25. 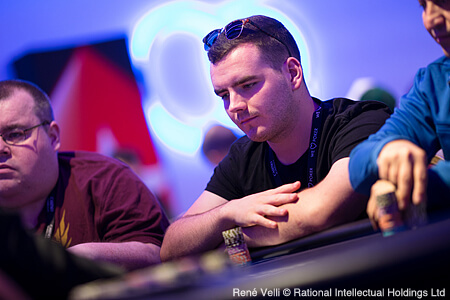 The buy-in is €215 with the top 10% of the field making it through to Day 2, which will be played live at King’s Casino Rozvadov, Czech Republic. Qualifiers to Day 2 will receive the min-cash amount of €400 credited to their PokerStars accounts and play their chip stack further into the money in the €1 Million guaranteed event. The live Day 2 takes place at King’s Casino on Saturday, September 2 at noon. This week’s half price Sunday Million was won by Ukraine’s ‘buba971’ for $183,815.47. The poker player defeated a field of 25,114 players for the largest slice of the guarantee-busting $2,511,400 prize pool. Team PokerStars Pro members Jason Mercier and Daniel Negreanu reached the final table of the World Series of Poker (WSOP) $10,000 HORSE Championship. Mercier busted in fifth place, collecting $83,415, while Negreanu departed just before him in sixth for $61,667. The title and bracelet went to American David Bach. Polish poker player Michal Janczarski collected €20,700 from the €170 PokerStars Festival Marbella MEGASTACK after beating a record field of 761 MEGASTACK players. The total prize pool was €109,584. PokerStars NJ sponsored player Damon Ferrante defeated a field of 188 players to win the Borgata Poker Deepstacks Challenge $200+$30 Deepest Stack NLH (Re-Entry) for $7,200. Ferrante will be donating 50% of his earnings, a total of $3,600, to St. Jude’s Children’s Hospital. The total prize pool was $36,472. Episode number of this week’s Poker in the Ears Podcast, which is now available to stream or download. Daniel Negreanu discusses his Vegas vlogs and celebrates his string of cashes at the World Series of Poker. Daniel Williams, aged 22 from the UK, finished in first place in a freeroll bounty at PokerStars and won a package to PokerStars Festival Marbella, including Main Event entry, hotel and travel. Lille’s stunning Casino Barriere welcomes PokerStars Festival Lille from July 15-23. Players can take a shot at the €600,000 guaranteed Main Event prize pool.